Remember my brief penultimate post regarding a London schoolgirl's slander of Israel? 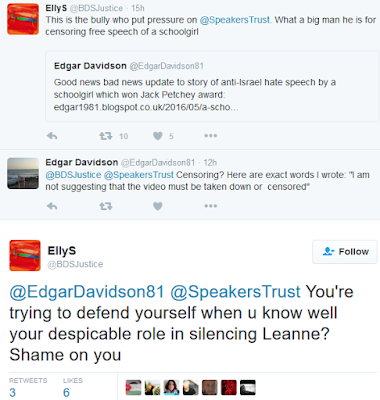 Well, that favourite blogger of mine, Edgar Davidson, has done an absolutely sterling job in following it up, and the brilliant Brian of London has made a superb must-be-watched video in response to Leanne's, addressed to her, and her headmaster and coaches. 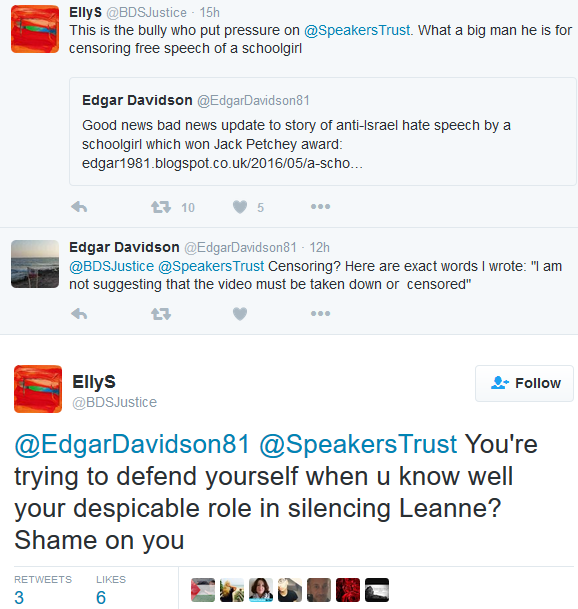 Not only has Edgar Davidson written three marvellous posts on the topic (the first here), showing, in the latest, apparent influences on young Leanne in the formation of her views, but (being never a mere keyboard warrior) he has been instrumental in persuading the Speakers Trust (to its great credit, the more so in its speedy response) to deny Leanne and her speech a further platform under its auspices. "Thank you very much for your email, which my colleague Rebecca Griffiths has this morning forwarded to me. We take your concerns very seriously. Every year thousands of young people are trained in the art of public speaking. They are encouraged to speak out on something they feel passionately about and of course they bring with them their history and culture and beliefs. - the speech must have a positive and uplifting message - in fact this is one of the core terms of the agreement with the Jack Petchey Foundation. - a speaker should never inflame or offend the audience or insult others and this, by definition, means that propaganda is ruled out absolutely from the outset. It is, however, the school that votes through its most talented speaker in an Assembly final and an independent panel of judges from the local community who select their regional winner. Speeches at this level will have been further developed and even rewritten, with the training guidelines but without our input on content. Judges do not mark a speaker down because they disagree with a point of view but they are clearly briefed on the those guidelines. Unfortunately, with over 18,000 young people trained annually, a speech that does not observe these ground rules may very rarely get through on passion and delivery. Last Saturday a Speakers Trust and Jack Petchey Foundation judging panel decided unanimously against sending Leanne Mohamad through to the next stage and she will not be speaking at the Grand Final. These were precisely our concerns. As a Speakers Trust trainer I was responsible for managing the schools in Redbridge and I have a close affinity with the region. Please let me know if you would like me to forward your email to Wanstead High School so that your comments and reservations may be heard..."
Mr Davidson has stressed that he has not advocated removal or censorship of the video of the speech, only that Leanne's defamation of Israel is counterbalanced by the truth. "... about love and peace?" Here's the text of a circular letter from "anti-Zionists" who seem totally unconcerned that lies and blood libels have been spread. 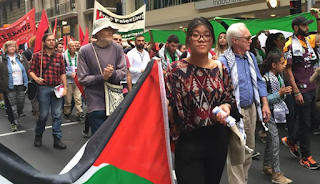 I am writing to request that you uncensor Leanne Muhamad of Wansted High School, the British Palestinian Award winning schoolgirl.Leanne Muhamad won the "Speak out" challenge after giving an impressive performance to enthusiastic applause. 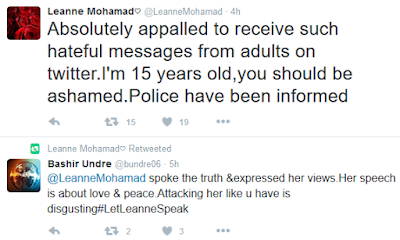 However one day later, following complaints from extremist anti-Palestinian blogger Edgar Davidson to the Speakers Trust (the charity that trains the students to take part in the Speak Out Challenge) you have now decided against sending Leanne Mohamad through to the final rounds of the competition.Julie Holness, CEO of the Speakers Trust, alleged that Ms Mohamad had breached “two fundamental rules that are made explicit during the training”. She said: “There are two fundamental rules that are made explicit during the training: the speech must have a positive and uplifting message - in fact this is one of the core terms of the agreement with the Jack Petchey Foundation [and] a speaker should never inflame or offend the audience or insult others and this, by definition, means that propaganda is ruled out absolutely from the outset.These "two fundamantal rules" are not written as Ms Holness shared them - and also were taken out of context - it is not stated anywhere about an "uplifting message" nor is it stated anywhere about "insulting others" nor any reference to "propaganda" in the topics recommended: Topics (note not rules) should be presented in a positive/constructive manner even if the subject is of a more serious or hard-hitting nature.Leanne Muhamad's chosen topic is extremely serious and she approached it in a highly meaningful and passionate way, as a call to peace. This is an uplifting message and I am writing to ask that you uncensor her and allow her to proceed in the competition, so that her voice can be heard and to repect the freedom of expression as laid down by the law. An "uplifting message"? Well, yes, for antisemites. This London teacher, commenting on the decision to withdraw Leanne's speech from the remainder of the competition surely misses the point, as do numerous others whose opposition to the decision is less politely expressed. Leanne's speech is inflammatory, inappropriate and unacceptable not because it presents its case but because (probably unwittingly on her part) it presents its case via falsehoods and misrepresentations, thus maligning Israel in a damaging and defamatory way, as so ably shown by Brian of London. 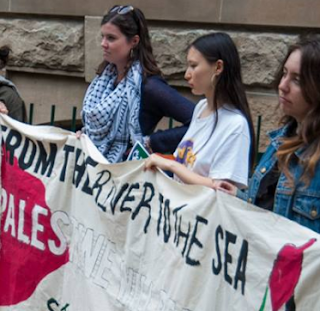 Schoolchildren should not be exposed to an anti-Israel message that relies on lies and blood libels. 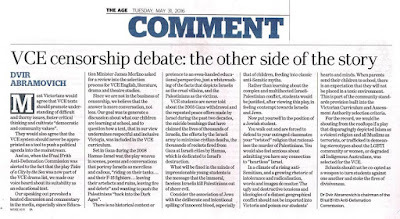 Incidentally, here's a current article in the Melbourne press regarding the propagandistic play City by the Sea that has found its way onto the school-leavers' exam curriculum in the state of Victoria (other states, watch out! ), news of which I broke on this blog. 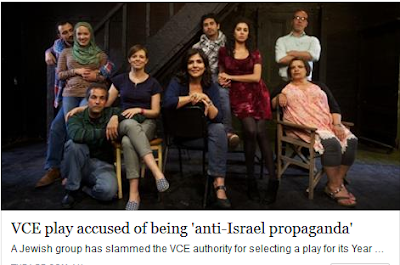 Anti-Israel propaganda aimed at schools seems to be de rigueur these days. 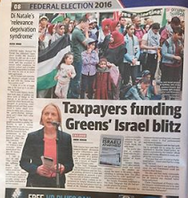 In the following article, entitled "Palestine – Rhiannon Propaganda Pamphlet Threatens Greens' Political Integrity", Sydney lawyer and international affairs analyst David Singer continues to focus his attention on anti-Israel propaganda (example at left) propounded by the incorrigible Greens Senator Lee Rhiannon. 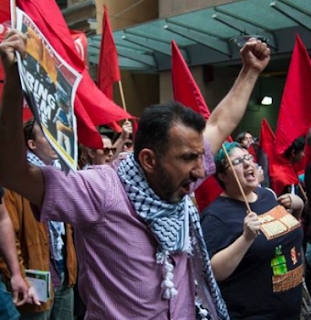 Australian Greens Leader Senator Richard Di Natale needs immediately to shred a misleading and deceptive pro-Palestinian pamphlet authorised and printed by Greens Senator Lee Rhiannon. The pamphlet contains two statements purportedly made by Israel’s Moshe Dayan in 1969 and Ariel Sharon in 1973. 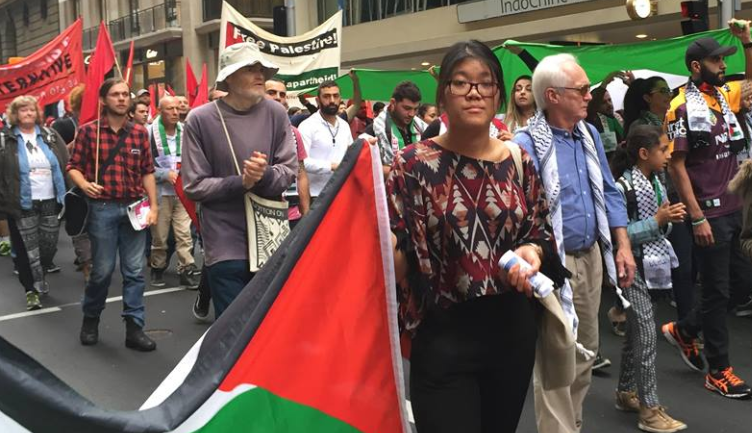 Why Rhiannon deleted Dayan’s highly significant remarks remains unexplained. The authenticity of Sharon’s supposed statement is shrouded in uncertainty. Michael Shaik writing in the Green Left Weekly claimed the statement was made by a British journalist boasting at Israel’s National Press Club. Churchill recounting a 1973 private discussion in such precise detail at the Washington National Press Club twenty eight years later – is highly suspect. Churchill never made any mention of this conversation with Sharon in his published speech at the Press Club – although he could have recalled the conversation as an aside or in some discussion with Aronson or others afterwards. Churchill’s bombshell revelation seems to have gone unnoticed as this contemporaneous report indicates. No other reports have been found. I have been unable to listen to or download a copy of a tape that apparently exists and could possibly shed some light on what Churchill said. Please help me retrieve it if you can. Whether that tape surfaces or not, a question mark must hang over the accuracy of Sharon’s previously unpublished 1973 private remarks – only disclosed by Churchill in 2001. Sharon and Churchill are not alive to confirm or deny what was said – yet the terms of this private conversation are quoted with unerring accuracy and entrenched as gospel in Rhiannon’s pamphlet. Rhiannon’s continuing use of Sharon’s “statement” – compounded by her excluding part of Dayan’s statement – raises questions as to the propriety of the Greens using this pamphlet to garner votes in the upcoming July Federal elections. Shredding these pamphlets has become an urgent priority. 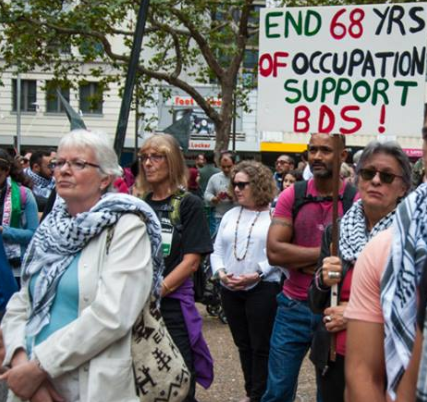 The Greens' political integrity requires its support for the Palestinian Arabs be based on solid grounds – not shaky foundations. 'Jack Petchey’s “Speak Out” Challenge! is a programme run by Speakers Trust and funded by the Jack Petchey Foundation. We believe everybody should have the skills, confidence and desire to speak in public, and are dedicated to helping people of all ages and levels achieve this. We are a registered charity, and work in partnership with the not-for-profit and social enterprise sectors – from prisons to schools, charities and community groups. Jack Petchey’s “Speak Out” Challenge! is available to every state secondary school in London and Essex. The training scheme is offered to at least one group of 25 students from Year 10 (the school can opt to take more workshops if desired). The school decides which pupils will participate. Speakers Trust strongly recommends that the training is offered to a cross-section of students in the year. This year's Redbridge Regional Finals Award has been won by Wanstead High School student Leanne Mohamad, who declares, inter alia, that "Islam is perfect!" and ends the highly tendentious emotive speech with"Let Us Together say 'Free Palestine! ", to thunderous applause. At the Jerusalem Post Annual Conference Mosab Hassan Yousef, the son of a prominent Hamas commander, pays warm tribute to Israel as "the only light in the Middle East", condemns BDS, the "apartheid" slur, and the political correctness that muzzles expressions of fear regarding Islam ("the Muslim people have a problem"), and issues a stark warning that the danger from Islam endangers the whole world, not just Israel. "There should be no racism in football" says the first interviewee in this Alex Seymour video from outside the Wembley Stadium before the FA Cup Final last week in which Manchester United beat Crystal Palace 2:1. No, indeed. And that sentiment should extend to the Israel-haters who spend so much of their time working to get Israel thrown out of FIFA. "Manchester United playing against Crystal Palace, two teams with Football Against Apartheid supporters amongst their fans. We were at the magnificent stadium at Wembley to leaflet and spread the word amongst football's devotees that Israel, as the only country in the world currently practicing apartheid in both sport and in day to day life, should not be allowed to get away with it and has to be penalized where it will most affect the man in the Tel Aviv street, by being excluded from FIFA, as part of the general BDS campaign to free the people of Palestine from the yoke of Israel's near 50 year occupation." 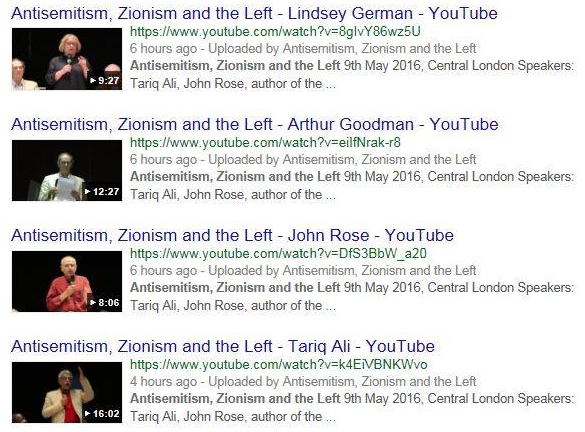 Antisemitism isn’t new to the UK Labour Party, and its recent antisemitic outbursts shouldn’t surprise anyone. Labour Party leader Jeremy Corbyn has ordered an “independent inquiry” into the party’s antisemitism. 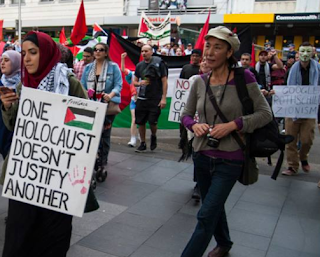 Gatestone Institute Senior Fellow Douglas Murray explains how Labour’s antisemitism problem starts at top of the party, and why this inquiry won’t solve anything. David Singer: "Fiction ... 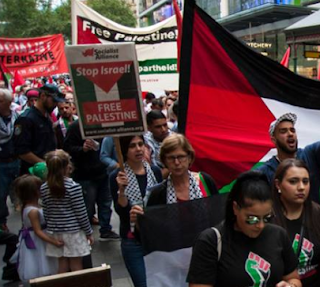 Designed to Deceive & Mislead & Possibly Incite to Violence & Jew-hatred"
Entitled "Palestine – Politicians Peddling Propaganda Forfeit Credibility", here is the latest article by Sydney lawyer and international affairs analyst David Singer. Senator Rhiannon has a Parliamentary staff to assist her in ensuring everything that issues in her name as a Senator is totally and completely accurate. 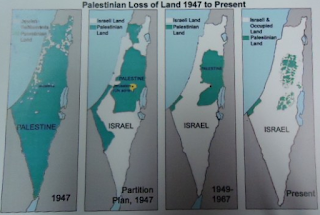 Another pamphlet containing four maps was handed out at the rally – supposedly documenting Palestinian loss of land between 1946 and 2000. McGraw Hill Publishing only recently withdrew from sale and trashed unsold copies of one of its textbooks – Global Politics: Engaging a Complex World – containing those maps. "As soon as we learned about the concerns with it, we placed sales of the book on hold and immediately initiated an academic review. The review determined that the map did not meet our academic standards. We have informed the authors and we are no longer selling the book. All existing inventory will be destroyed. We apologize and will refund payment to anyone who returns the book." Senator Rhiannon is perfectly entitled to express her support for the Palestinian Arabs. 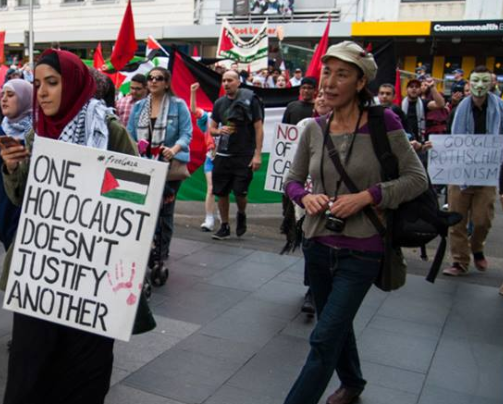 It would be encouraging to know, however, that her support is based on fact – not fiction and partisan propaganda designed to deceive and mislead and possibly incite to violence and Jew-hatred. Senator Rhiannon has badly blotted her copybook – and credibility. 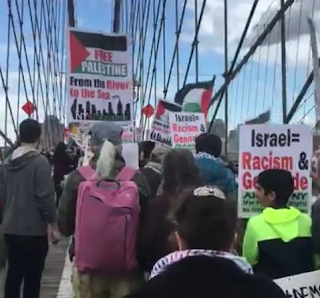 On "Nakba Day" in old New York, a long stream of American Arabs and assorted Israel-haters (including a contigent of Neturei Karta nuts) tell the Brooklyn Bridge exactly what their aims are. "We Don't Want No Two State, We Want '48" they scream over and over. 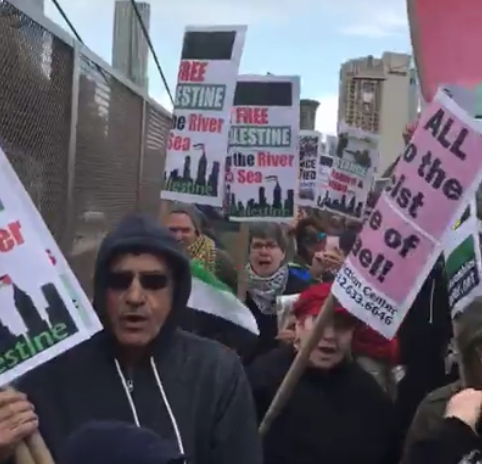 And "There is only one solution: Intifada Revolution"
The old "From the River to the Sea ..." mantra is both seen and heard too. And how. Declares their personable and articulate leader, they are "calling for the dismantling of the Entity Israel ...." and will never rest until every city from Haifa to all of Jerusalem is theirs. You can see a video of this event by scrolling down this Facebook page. There's a shorter, different video (on YouTube too) on the link below that captures some of the flavour, but not in all its infinite variety. "The great crime of the 20th century is now the great crime of the 21st century." 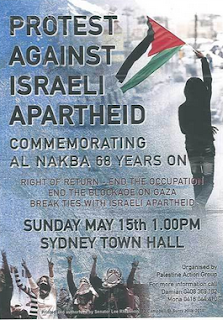 That's how, according to an excellent must-read report from J-Wire, the Israel-hating BDS-loving part-Jewish Greens Australian Senator Lee Rhiannon, the daughter of hard left parents, described the Nakba at this year's "Nakba Day" rally in Sydney. 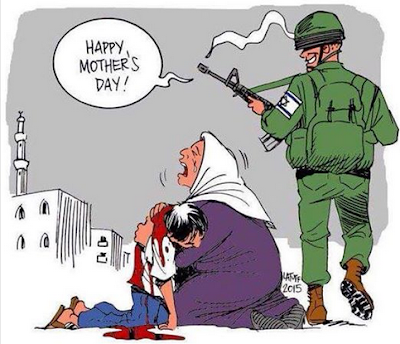 Yes, it seems that all of Israel-hating human life was there. 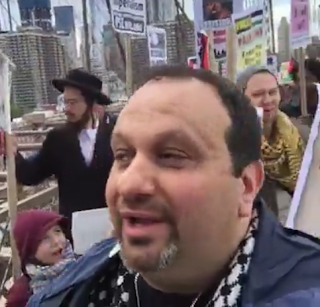 The ludicrous "Jews Against The Occupation" also turned up, but since they'd fit inside an old-fashioned telephone booth and still have space over I haven't bothered to include them. 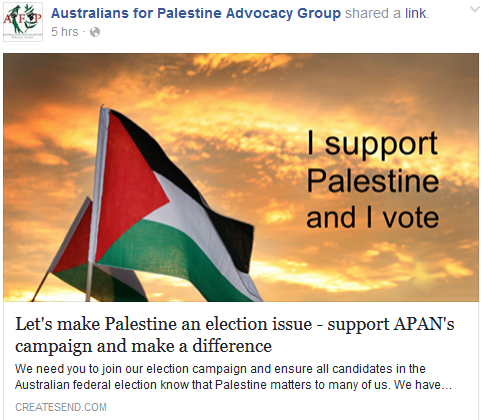 I trust that Senator Rhiannon, a staunch feminist who nevertheless denounces "Islamophobia"
The Anti-Israel-obsessed Left is lobbying hard. 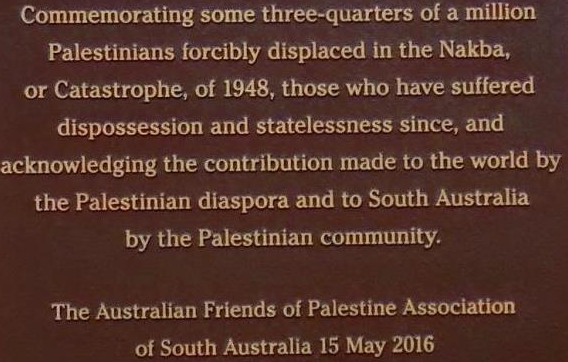 "Nakba Day" has also seen a squalid development in Adelaide. The Migration Museum in that city is a South Australia state government institution that according to its website "works towards the preservation, understanding and enjoyment of South Australia’s diverse cultures. It is a place to discover the many identities of the people of South Australia through the stories of individuals and communities". 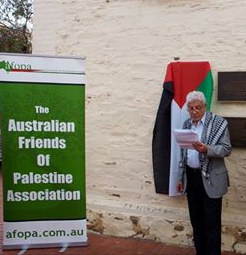 However, on Sunday 15 May political divisiveness and demonisation of Israel intruded upon the multicultural ethos, since the Museum permitted a "Nakba Day" event under the auspices of AFOPA (Australian Friends of Palestine Association) to take place for the purpose of unveiling a plaque headed "Palestine" commemorating the "Nakba, or Catastrophe" (text shown close-up below). 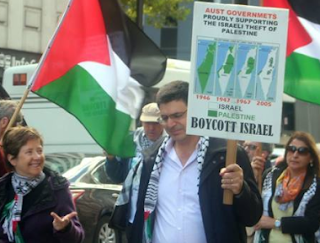 As I noted recently, AFOPA's patron is Adelaide barrister Mr Paul Heywood Smith, whom I mentioned here recently with regard to his writings concerning Israel. "We suffered greatly as a result of our displacement. We became a stateless people. We lived as refugees, struggling for recognition, struggling for survival and waiting for the day when we can go back home. We still wait for the day when we can go back home. Today marks the 68th anniversary of the Al Nakba - the Catastrophe of Palestine. 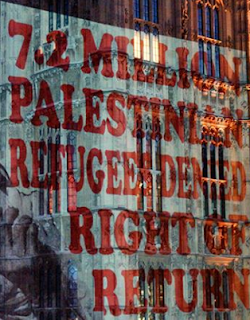 Today I am sad to say that the Palestinian displacement and suffering has not stopped.... The Israeli Separation Wall, which is illegal under International law and which has destroyed any possibility of a contiguous Palestinian land, continues. And today we witness the siege of more than two million Palestinians in Gaza. 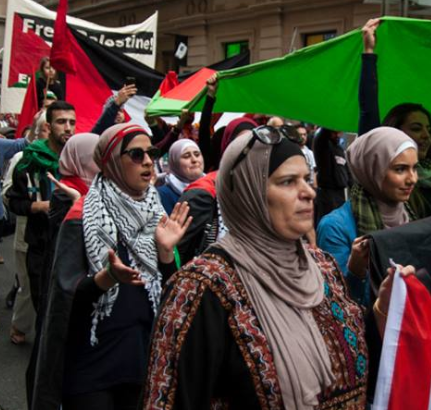 Gaza stands as the world’s largest and most densely populated open air prison, with the Palestinians denied autonomy over access to their land, and denied autonomy over their sea and air space. 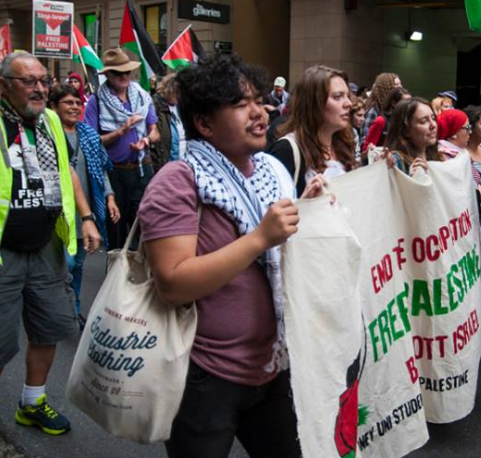 Today we are calling for all people who believe in human rights and all governments who proclaim democracy, equal opportunity and justice to stand by the Palestinians. To help them regain their freedom; their rights and their autonomy. 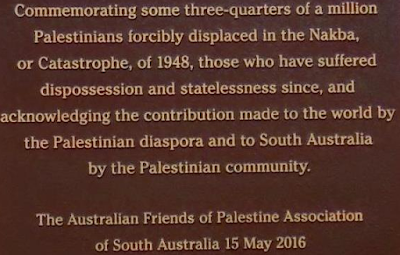 We are grateful and indebted to the Australian people for their support, and we are indebted to the Migration Museum of South Australia for acknowledging us and for commemorating the suffering of the Palestinian people; and for acknowledging the contribution of the South Australian Palestinian community with this plaque...."
Remember my posts here and here about the infiltration of anti-Israel propaganda packs into British schools by the Palestine Solidarity Campaign (PSC) in alliance with CAABU (the Council for the Advancement of Arab-British Understanding) and the National Union of Teachers (NUT), Britain's largest teachers' union? ".... 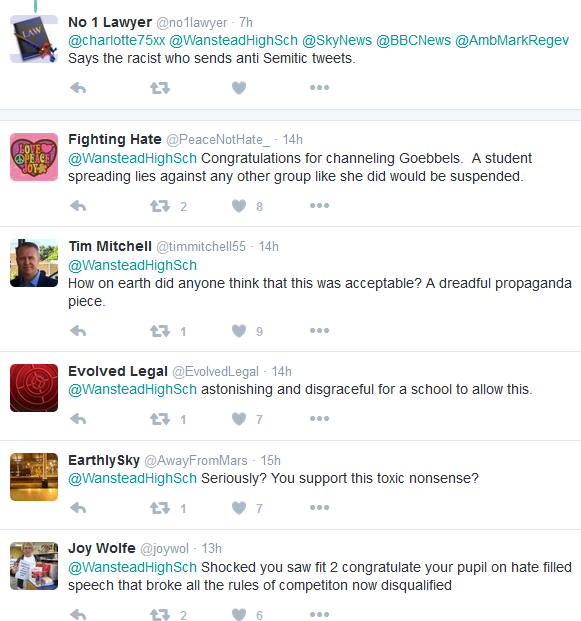 This Jew hatred, this historical revisionism, this support for terrorism, has no place in our school system. We need to ensure that the NUT distances itself not just from these remarks, but from this insidious poison that underscores the PSC movement. So I say to the NUT directly. On Saturday 14th May, I was thrown out of your HQ. 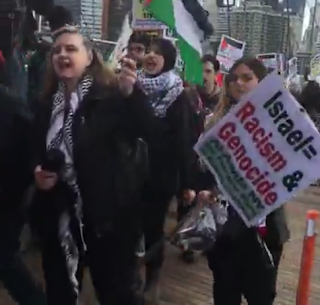 I was thrown out shortly after hearing antisemitic, terrorist supporting garbage loudly applauded inside your headquarters. I deserve both a response and an apology." "As a Palestinian I am here to tell them ... We will return one day!" 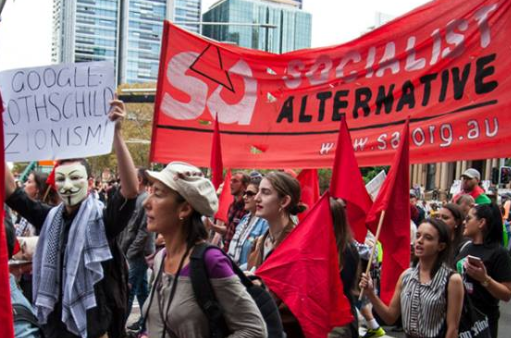 screams a familiar speaker outside Parliament in this video by our old friend Alex Seymour. 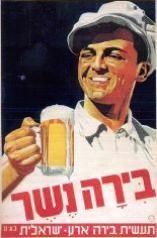 The end of the entire state of Israel is the aim. 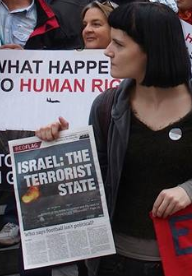 This "Russia Today" newsclip was posted by "London Palestine Action", the group that, among other escapades, pastes anti-Israel posters that look just like bona fide advertisements on London Tube trains. "A rally organised by London Palestine Action to mark the 68th anniversary of the Nakba in Palestine, was met by a group of around 25 people from the UK zionist federation heckling the participants and screaming "terrorist" at them in London on Nakba Day, Sunday. The group of around 100 pro-Palestinian activists were attempting to carry out a peaceful traditional Palestinian Dabke dance outside a Sabon store, an Israeli company that operates in illegally occupied territory in Palestine. 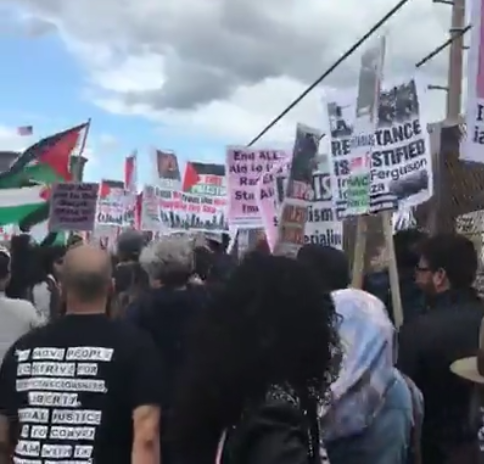 However, the participants were harassed and intimidated by the group of zionists, who followed them through the streets screaming "terrorists" and chanting against them." 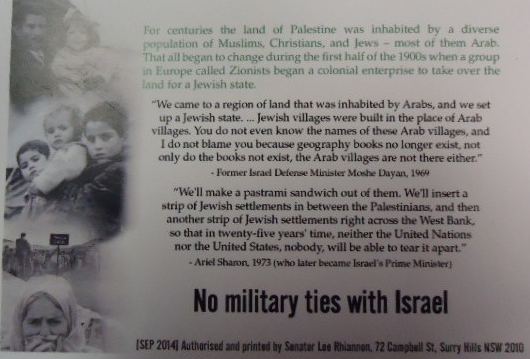 "From the UK Zionist Federation"? Really? 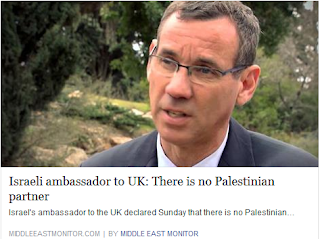 See also the brilliant Mr Regev on the Sussex Friend of Israel's video that I've shared on my Facebook page; introduced by Jonathan Arkush, he delivers a very fine address indeed to the British Board of Deputies. Ending the plague of anonymity on the Internet seems closer to fruition following moves this week by the UN Security Council. "there is no silver bullet that will stop terrorist use of the Internet"
"For the internet industry, the scale of the terrorist challenge is daunting. 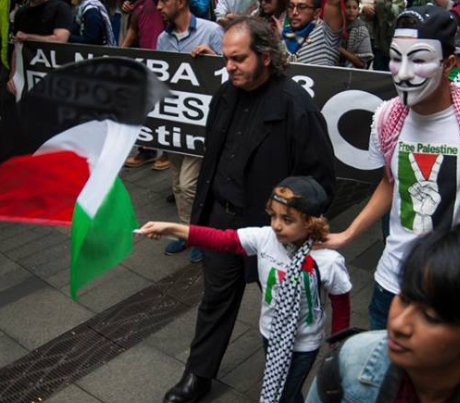 We know that there are tens of thousands terrorist internet accounts that refuse to die. As one is taken down, another quickly springs up in its place." Crown’s appearance marked the first time a representative of a technology company has addressed the UN's most powerful body. Crown was surely being naïve in expressing this opinion. The use of the Internet as a communications tool has been fuelled by the anonymity afforded to those who use it – enabling all kinds of hate and incitement to be spewed out daily without recourse to those who claim to have been legally affected by those who make their vile and outrageous statements. Surely the first step in any move by the Security Council to combat this “Internet Intifada” is to insist that all member States impose laws in their jurisdictions compelling all Internet providers to insist on the name, addresses and contact phone numbers being provided by all registered users of their websites – including those seeking to post comments. These details would be held by the Internet provider and could be subpoenaed in any proceedings brought in a competent court of law by persons claiming to have suffered as a result of any offending publication. Large penalties would be prescribed for those providers who failed to check the bona fides of those using the internet. US Ambassador Samantha Power correctly said it was important to protect free speech. "As we consider the task of countering violent ideologies we all must recognize that the common goal of countering terrorist ideology should never be used as an excuse to suppress political dissent. Legal action is a critical tool in the campaign against ISIL but it must not be wielded like a cudgel against those who voice unpopular speech or criticize authorities. 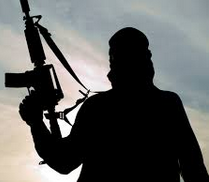 Such behavior doesn't prevent violent extremism, it fuels it." Ending anonymity on the Internet is not a threat to free speech. It does not prevent anyone saying whatever they want to say within the bounds of what is legally acceptable. Anonymity has been widely rejected by most newsprint around the world. Popular talk back radio shows have a seven second delete button to filter calls deemed to be outside what is legally permitted. 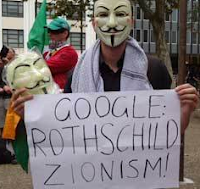 Ending anonymity on the Internet – if prosecuted by all UN member states – will lead to those tens of thousands of terrorist internet accounts currently in existence and their would-be successors being quickly and effectively eliminated. If people are not prepared to reveal their identities – don’t publish. The things the PSC clowns on the High Street say! It would be laughable if it weren't so despicably ignorant. Here, in this video by arch-BDSer Alex Seymour (whose rather pleasant tones can be heard off-camera) a woman from the Slough PSC spouts nonsense and holds those equally nonsensical maps. That's right, the maps that the contemptible Jewish Voice for Peace have been challenged by David Singer over. No surprise that David (whose wise words regarding combatting lies against Israel including those mendacious maps can be read near the top of my sidebar) still awaits an answer from those demons. 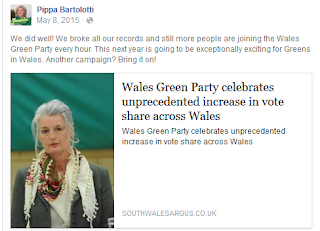 Oh, and if you want to see my latest post regarding British Greens leader Pippa Bartolotti and her take on antisemitism (a post which landed in an unexpected spot!) please scroll back to here! Nobody tells it better than Ms Melanie Phillips. A must-watch (or listen-to) video. Nearly an hour's worth of footage, but this wonderful woman is worth every minute. ISGAP program from the ISGAP Center in NYC. ".... Then after [each panellist spoke] for a few minutes each, in the spirit of good comradeship the microphone began to move around the floor. One after the other repeated the sentiments of the panel. ‘It is a witch-hunt’. 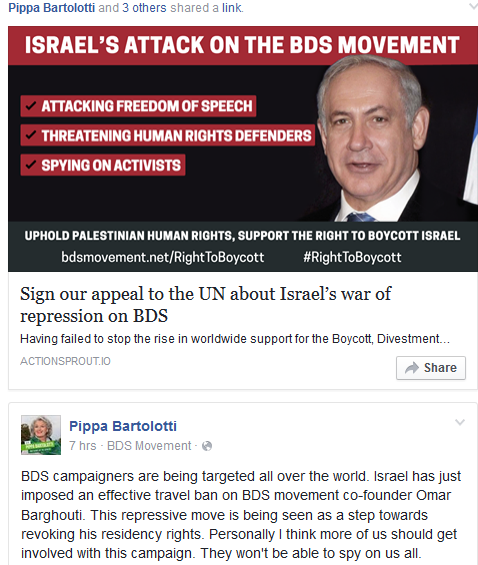 ‘Antisemitism is a right wing disease’. 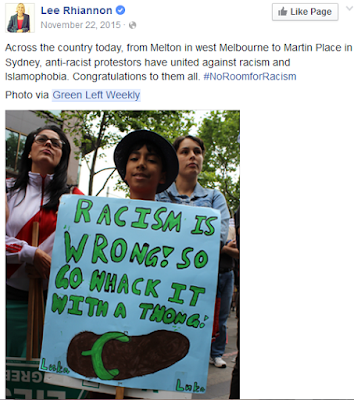 ‘Left wingers hate all forms of racism, especially Islamophobia’. 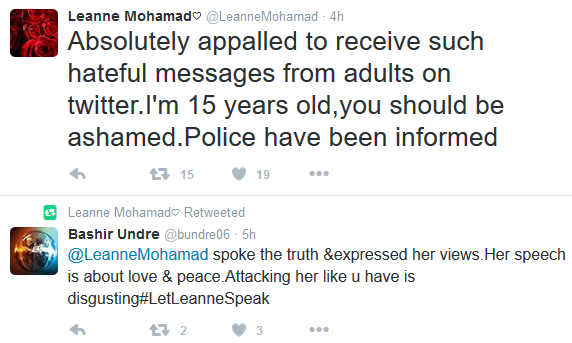 Over and over again, ‘Islamophobia’, ‘Islamophobia’, ‘Islamophobia’. 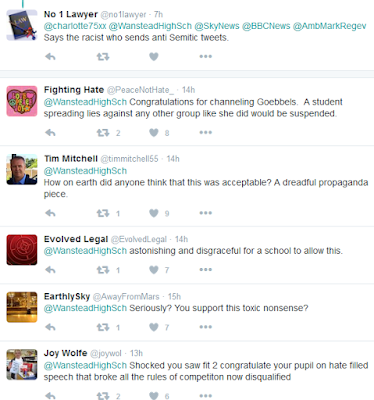 Several suggested ‘hiding the hate’ might be a good idea for tactical reasons (something to bear in mind). Eventually, someone said it, this whole episode isn’t even about antisemitism, it is about Islamophobia, ‘they’ (I assume Zionists?) ‘are using this to attack Muslims’. Loud applause. A special mention needs to go to Jonathan Hoffman. Jonathan is a vocal Zionist presence at some of these events. When the microphone arrived at his door. He made full use of it. You can hear his comments below. Fighting the fight the way he does, is I assure you, emotionally charged and draining. This was an extremely hostile room of radical thought. He deserves both our appreciation and gratitude." It's a dreary old night here in Oz, and brewing up a storm. So I'm glad I found this. Being a well-brought up gal (and also very conscious of the old adage that "pride has a fall") I hate to boast and am not very fond of boastful types. Nevertheless I'm quietly chuffed that in my blogging career I've had a couple of scoops, so that my keyboard warfare has not been entirely wasted! One, happening to spot and screen-grab Stephen Sizer's despicable 9/11 tweet shortly after it was posted and sending it to the London Jewish News after the Jewish Chronicle (caught inexplicably napping) in effect told me "Thanks but no thanks". The rest, of course, thanks to the British Board of Deputies' current excellent president, is history! 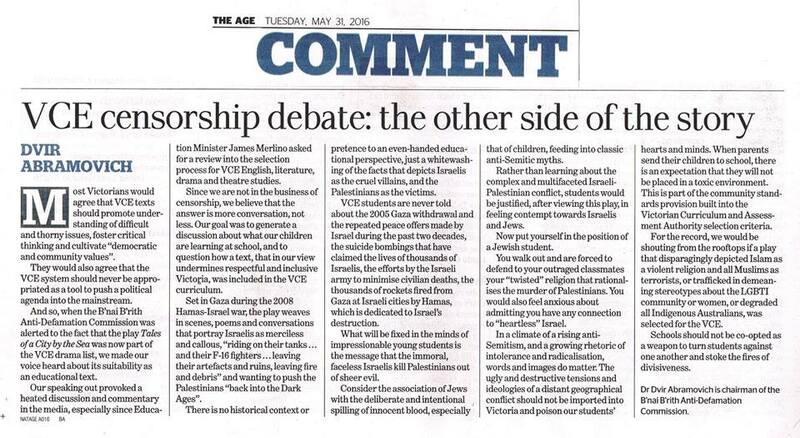 Two, bringing this propagandistic play that's on the current VCE curriculum to readers' attention, having, to my amazement, failed to find any mention (much less condemnation) of it in the expected sources. Now, The Age newspaper has picked up the story, owing to the admirable Dr Dvir Abramovich of the Anti-Defamation Commission in Victoria expressing real and justified concerns. Needless to say, the Israel-bashers are mounting a counter-attack, including some from, or linked with, a frightful group of leftist as-a-Jews that I won't bother to name. Ms Bartolotti certainly deserves a place in the pantheon (if that's the right word!) of British anti-Israel politicians identified in this blog post by the redoubtable Edgar Davidson. A friend of mine has a formula that he reckons works half or even two-thirds of the time. He calls it Cherchez Le Juif. 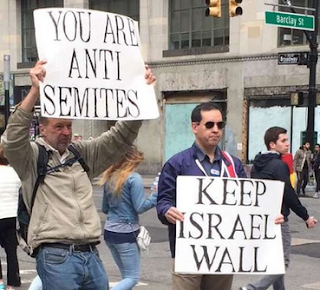 He says "if a person's more antisemitic than they ought to be, look for the Jewish grandparent". Both Ken Livingstone and Jeremy Corbyn have suggested that they might well have a Jewish forebear: but have yet to produce the goods. (Dear old granny, in Ken's case, I seem to recall.) Good figleaf, say what?